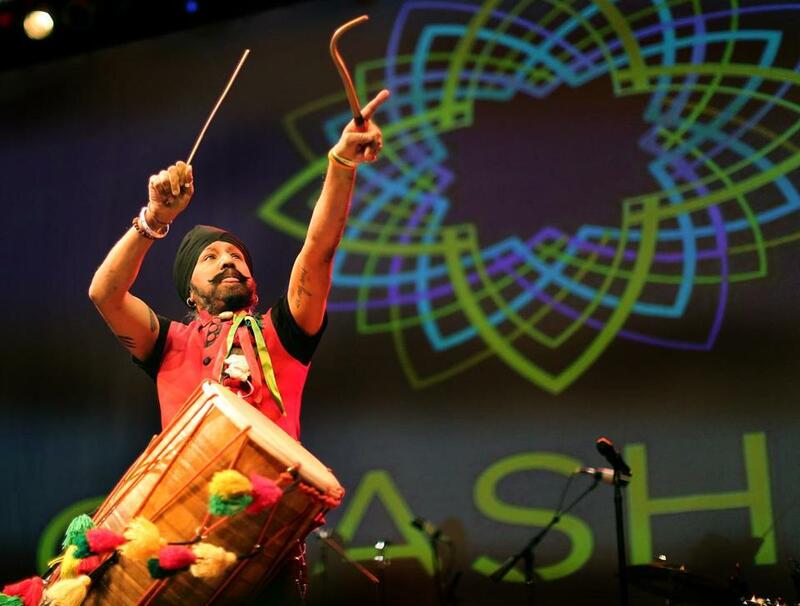 Johnny Kalsi of the Dhol Foundation performs at CRASHfest Sunday. Ten musical acts gathered from three continents at the House of Blues on Sunday for the first ever CRASHfest, a 5½-hour marathon that passed like a tropical breeze. Though 300 tickets were promotional giveaways and the club had nearly a thousand left unsold, the 1,500 attendees who ceaselessly roamed among the three performance spaces ranged in ages and ethnicities far more than most festival audiences do. It testified to the reach of local promoters World Music/CRASHarts, which organized the show to mark its 25th anniversary. The smooth logistics also testified to CRASHarts’ quarter-century of experience. Stalls selling ethnic food ran out early, but the musical acts mostly ran on time, their transitions aided by clever inter-set programming. While the bearded young Virginians in Steel Wheels prepped for their richly harmonized mountain music, for example, a belly dancer writhed before an appreciative circle on the other side of the plush Foundation Room. The contrast typified the eclecticism of the festival’s world-music-plus programming. Some acts defied classification, like the Debo Band’s slamming Ethiopian psychedelic funk, which thrilled a crammed crowd at the “Locals Stage,” or Kishi Bashi’s woozy, violin-powered art-pop (call it world emo), the main stage’s smallest draw. Improbably, Benin-born Afro-pop superstar Angélique Kidjo combined both traits in her show-capping set. To start, Kidjo easily won over the club’s main hall with her strong vocals and Dominic James’s lilting guitar. But after the irresistible “Pata Pata,” Kidjo got folksy, first by sauntering through the crowd during “Afrika,” and then by inviting the audience onstage to close the show with “Tumba.” Fans then took turns showing their dance prowess before a conga player, and everybody was a star.